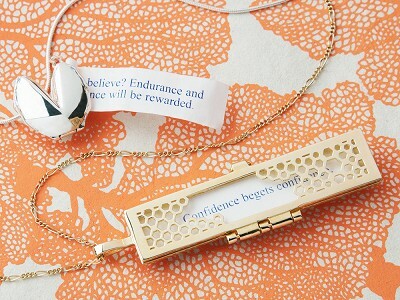 These fortune lockets and pendants each contain an elegant note-to-self as a wearable reminder. Maker Gretel Going believes it’s important to hold your inspiration close. 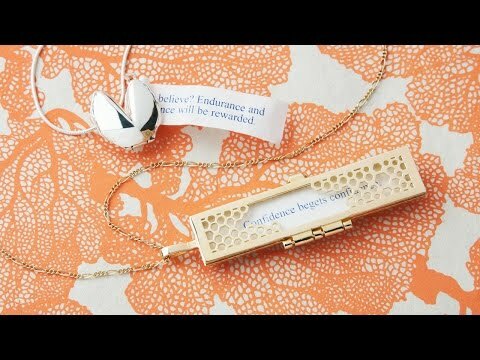 After she found an insightful fortune in a cookie and put it on the fridge, she set out on a long journey to learn jewelry design in hopes of creating a better, more beautiful way of showcasing fortunes. 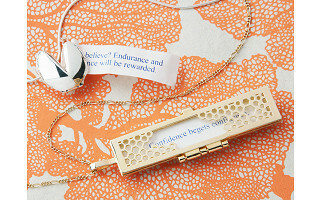 From delicate metal envelopes that showcase slips of paper to tiny, hinged fortune cookies that hold words of wisdom, each elegant necklace carries a personally meaningful message. 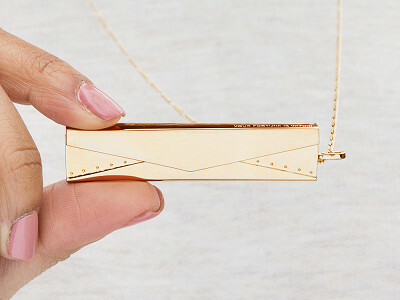 The sentiment behind them is reminiscent of classic, heirloom lockets you might inherit and slip an old photo into. 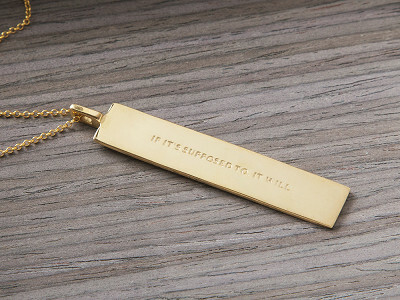 Except these necklaces encourage you to look into the future as much as the past. Hi Everyone! I’m happy to be here sharing pieces from Fortune & Frame with you. 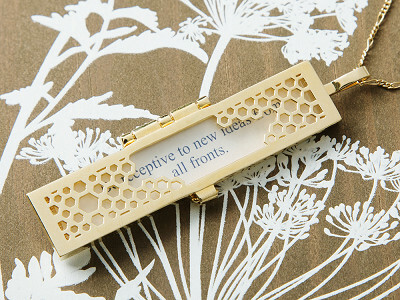 This line was inspired by a special fortune cookie I held on to a few years ago. I wanted something beautiful to store it in but all I could find was kitsch, so I set out to create something special. The Grommet has curated a collection that represents both new and original fortune-inspired pieces—I hope you like them! @Jennifer Thanks, Jennifer! Yes, we're working on introducing pieces at lower price points and trying to bring down pricing on some of our current pieces. We've been producing in NYC, which is super expensive, but as we expand overseas, we finally see the light at the end of the tunnel! @Gretel I would do this in a heart beat if the price point was lower. @karen Thanks for that feedback. We'll work with the Grommet to see if they can begin carrying our un-plated brass pieces, which are beautiful and bring down the price. 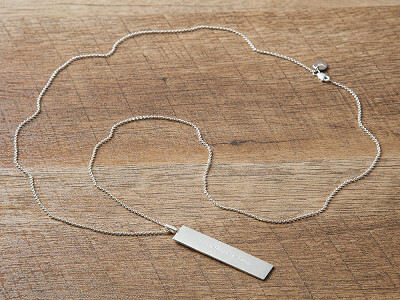 Why don't you offer one in sterling or stainless steel? Not everyone has endless amounts of disposable income! @Gretel, sorry to hear that yet another product made in the USA is looking at making something so unique overseas. I too would love to purchase at a lower price but if it goes "across the pond" - I'm out. Sorry. Hi Cheryl, Fortune and Frame the continued work Gretel references is improving the manufacturing relationships they've already built. @Mike @cheryl Many of our pieces are still made in the USA, but the cost of U.S. production does not support the lower price points of our brass-based lockets.